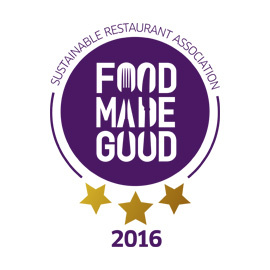 All 6 restaurants in the Anglian Country Inns group (ACI) have been awarded a 3 Star Food Made Good rating by the Sustainable Restaurant Association (SRA) in recognition of its commitment to serve customers food that's good in every way, delicious, ethical and sustainable. SRA conducted a wide-ranging assessment of all 6 ACI establishments before awarding this outstanding rating. The Food Made Good rating covers all aspects of a business and everything that goes into making the food good, focussing on three main areas, Sourcing, Environment and Society. This amazing recognition means that the ACI group of 6 restaurants joins the likes of Raymond Blanc's Belmond Le Manoir aux Quat' Saisons and Hugh Fearnley-Whittingstall's River Cottage in a rapidly growing group of restaurants sporting Food Made Good stars in response to consumers' increasing appetite for a dining experience that fits the sustainability bill and doesn't cost the earth. *ACI scored a perfect 100% in the Treating People Fairly section of the Food Made Good rating - providing apprenticeships, extensive training, as well as gym memberships and cycle to work schemes.